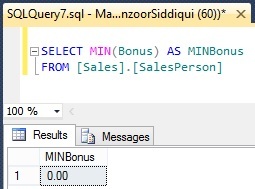 SQL MIN() function returns the smallest value from the selected column. To understand MIN() function we will take example from [SalesPerson] table of AdventureWorks2012 database. We are selecting all rows from SalesPerson table. For demonstration we will find minimum of SalesYTD from SalesPerson table. 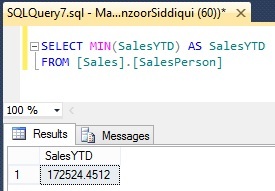 You can refer the output and compare from SalesYTD column in SalesPerson table as it is the minimum value from that column. Similarly, we will take one more example from Bonus column as follows. – Min() function ignores null values. 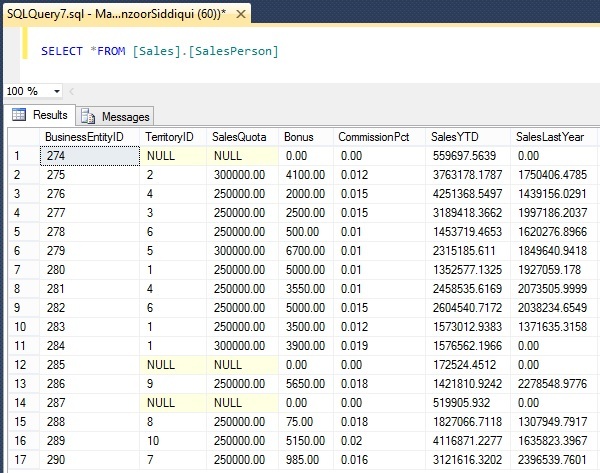 – For character columns, Min() function finds the lowest value from collating order i.e. from alphabets A-Z, it will return ‘A’ as minimum value.